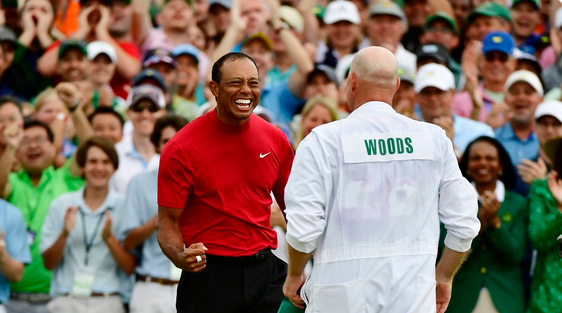 What did it take for Tiger Woods to make this great comeback after so many years of personal and professional struggles? Other than my job as a career coach, I am a sports fanatic! I don’t play any sport, but ask me what’s going on and I can tell you. Right now it’s playoff season for the Toronto Maple Leafs and Raptors, and am getting nervous. The purpose of this article, however, is the big news about Tiger Woods’ win yesterday, and what job seekers and career changers can learn from it. It was April 15, 2008, that he won his last major championship. Yesterday, almost 11 years to the day, he won his 5th Masters and added another green jacket. (It was 14 years since he had won his 4th Masters). What did it take for him to make this great comeback after so many years of personal and professional struggles? His will to win. He said in an interview, “I feel I can win.” He ingrained it in his head that he could win, and went about doing all the little things it took to make it happen. He didn’t spend time focusing on what his competitors were doing. His eagle-eyed focus was on where he was going and what was at the end – his goal of a fifth Masters championship and another green jacket. What about you? Can you see yourself being so relentless with your job search or career? Do you see yourself bouncing back from so many failures and disappointments, or, are you getting ready to give up? Theodor Seuss Geisel, aka Dr. Seuss, was rejected 27 times by publishers before getting his big break. He was ready to give up, and was planning to destroy his manuscript when he met his friend who had just become an editor at a publishing company. The rest is history! Tiger said “This stuff is hard. I made a few mistakes at the British Open last year and it cost me a chance to win.” He said he had serious doubts if he could play well enough to win, but when it mattered most, he dug in and won. He told himself that despite not being as strong as in his prime years, he still had good hands and if he could put the pieces together, he could win, and he did. Create a success plan and harness all the support you can get to see your dream come through. Determine what your strengths are, and capitalize on them. Tiger relied more on his hands because his back was not as strong as before. Be relentless in your pursuits. Remember that “A winner never quits, and a quitter never wins”. Never give up on your dream even if when it appears insurmountable. Don’t jump off the train while it’s going through the dark tunnel; there’s light on the other side.